Description: Black Vultures are large birds between 20 and 26 inches in length with a wingspan of nearly 5 feet. 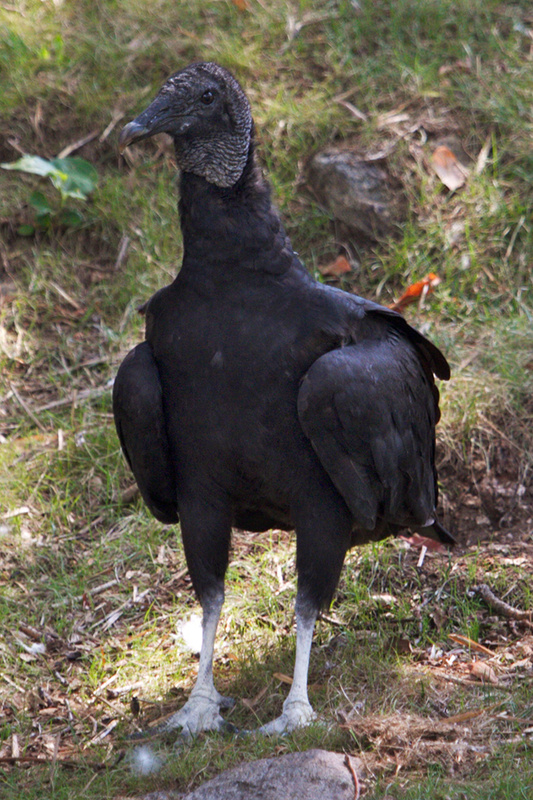 They have glossy black plumage with featherless gray heads and grayish-white legs. They have blunt talons and long front toes. They are seldom heard and have no voice box but can be heard making soft sounds including barks and hisses. Habitat: Open, thinly wooded areas, moist lowland forests, grasslands, wetlands swamps and urban areas. Range: Southeastern U.S. from Texas south to Central and South America. In recent years Black Vultures have extended their range into the Pennsylvania, New Jersey, New York and southern New England as well as other areas of the Northern United States. Diet: Carrion (the remains of dead animals), eggs, newborn animals, garbage and occasionally fruit. Life Span: Up to 5 years in the wild and up to 30 years in zoos. Family Life: Black Vultures breed depending on latitude. They don’t build nests. They lay a clutch of 1 to 3 grayish-green oval eggs on the ground in a wooded area or cavity. Both parents incubate the eggs. After 28 to 41 days, the eggs hatch. The hatchlings are covered with white down which is lost when their adult plumage grows in. They remain for another two months while both parents feed them regurgitated food. They typically fly at about 75-80 days. Status: Common: in the Western hemisphere Black Vultures are one of the most numerous birds of prey. These birds are protected by law in most of the United States. Wild Black Vultures frequently exhibit themselves by visiting our New England Farmyard, Amur Tiger and Bald Eagle exhibits year ’round. 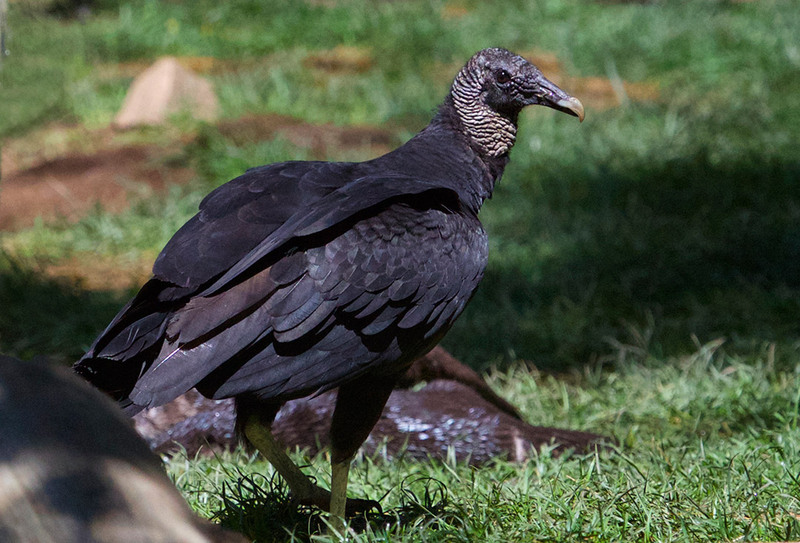 These “small” vultures are known for their curiosity (they have been known to “hitch a ride” on the backs of our large hoofed mammals to get a good close view of the Zoo). They are also known for their aggression and strength (they push larger Turkey Vultures away when feeding at a carcass as Black Vultures have greater power to puncture thick hides). These interesting birds are seldom heard but may make soft sounds including barks and hisses.